Most of you out there remember the days of the College World Series being played at Rosenblatt Stadium in Omaha before it was moved to the new TD Ameritrade Park downtown in 2011. I want to share a short story that explains why the closing and subsequent demolition of the stadium means so much to me. I grew up on 15th street in Omaha, a few short blocks from Rosenblatt, which sat high on a perch on 13th Street next to Zesto’s Ice Cream. I worked there forever, catching foul balls hit up on the screen behind home plate, shagging balls all over the field and sitting in the manual scoreboard out in left field and dropping the numbers into the slots. Then came the inevitable sprint home in the dark while outrunning the various villains and boogie men that were surely nipping at my heels. The AAA Omaha Cardinals called Rosenblatt home through 1959, when I was the ripe old age of nine. Bob Gibson, Curt Flood and manager Johnny Keane played in Omaha and then the Dodgers brought their AAA team to Omaha from 1961 through 1962. Rosenblatt was home to the College World Series all through this period and was the only game in town after 1962 until 1969 when the AAA Royals came to town, where they continue to this day at TD Ameritrade Park. Why is this interesting? Just last weekend I found myself in Omaha after many years of absence. 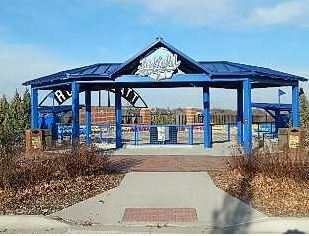 I felt compelled to visit the old site, located next to Henry Doorly Zoo, and was a combination of sad at the changing skyline yet happy that the city officials found it beneficial to create a mini-field in honor of the old Rosenblatt site. ‘Infield at the Zoo’ was created and opened in 2013 and is beautifully assembled as a small stadium where kids and parents can run the bases, take a step back in time and see plaques and original seating from the good old days. Having sat in those exact seats while visualizing hundreds of bouncing balls I chased over the past fifty years, and also seeing the exact locations of first and third base, brought a tear this old geezer’s eye. I snapped a few shots while there and wanted to share them with you in case you wanted to see how it looks today after those many years of following the best collegiate and pro ballplayers on television or in person. Just the phrase ‘Rosenblatt’ has a way of taking you back to that hill in Omaha that created so many memories, regardless of where you lived. Enjoy! 2017 MSBL Kickoff Classic In the Books: Ten Champions Crowned!